You are here:Home Articles Where can I warm up before my gig? Sometimes when you go to do a gig, there is no dedicated artist space for you to warm up your voice before you start to sing. This handy guide will give you some ideas of where you can warm up! If your venue is fairly close to your home, this is your best bet. You can do your full warm up exercises in the privacy of your home before you get to the venue. When you get there, some lip trills or edgy M scales will give you that extra boost without attracting too much attention. If you have to drive to the venue, then you can put your warm up track on whilst you are driving. Normally when you are about 10 minutes away from performing is a good time to warm up. Again, right before you go on some lip trills or tongue trills will give you that extra boost before you start. Remember, you can always ask if you can borrow an office or back/store room for 10 minutes to warm up. It’s a simple enough request, and most people will be impressed that you want to look after your voice before you start your set. If there really is absolutely nowhere at the venue that you can go uninterrupted for 10 minutes before you start to sing, sitting in the car is the closest you’ll get to a dressing room. It will at least ensure that you aren’t disturbed mid-exercise! Just make sure you leave enough time to warm up before your set to do this. Your very last resort could be to use the toilets at the venue. A cubicle will afford you a bit of privacy and ensure you aren’t disturbed during your track. Of course, this will give the audience a preview of your voice and what you might sound like, and isn’t really very sanitary so should be avoided if possible! 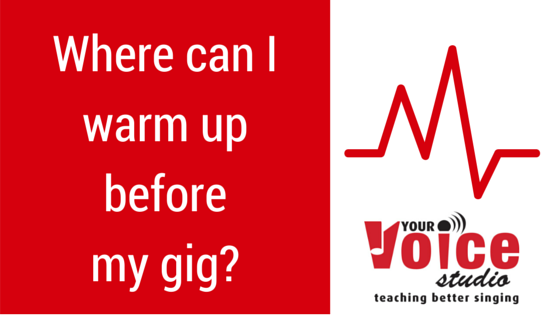 Remember, looking after your voice is your number one priority when you do performances or gigs. Make sure you factor in the time to warm your voice up slowly and properly before you start the soundcheck and your set. You only get one set of vocal cords, so looking after them will ensure they last the length of your career! Check out this great blog post if you want to know more about why you need to warm up. What are your experiences of places to warm up before a gig? Do you have a favourite spot, or a tried and tested routine? Share with us in the comments below, or let us know via our social media pages!